Another year has come and gone (well, almost). It has been an interesting one for sure. I’m not going to focus on the negatives of 2016 in this blog. I’m here to do what I do every year – talk about the best gigs I’ve been to in the last year (I’m sure these introductions are getting shorter and shorter each year). Cancer Bats – Wedgewood Rooms, Portsmouth – January – I’d love to be able to wax lyrical about this gig. However, “beers before Bats” occurred (as well as beers during Bats) and as a result, there are chunks of the gig I simply don’t remember. Cancer Bats don’t do bad live shows though, and the bits I can recall back this up – which is why this is an honourable mention. People who get twatted for every gig they go to must have a lot of money to fritter away. Not remembering all this gig due to the drink is not a good thing! (Neither was working through the hangover the next day…oofh). Also, Palm Reader were really good. Crossfaith – Wedgewood Rooms, Portsmouth – March – Sure they were fun but it fell on the same night as I did a 10k run for charity, so turned up already knackered. Thinking back on it now, I can’t remember a great deal from it. It was a pretty short headline set from what I recall though. Morass of Molasses – Edge Of The Wedge, Portsmouth – April – To my shame, I don’t tend to go to many small local gigs. Going to this was a good call though as this was a really good gig from top to bottom. The other bands that played were Foxer, Victorian Whore Dogs and Sahara Snow – all 4 were really good. Morass though were my favourite band of the night and I’m very tempted to grab an Icebreaker Festival ticket for next January just to see them again. Riffs for days! Muse – O2 Arena, London – April – I thought after it happened that this gig would without doubt be in my top 5. When I drew up my original list it was towards the bottom end, eventually falling out of the top 10. It would have been 11th had I done a top 11 though. The stage was in the round, sort of, which is pretty cool – only the second gig I’ve been to with that set up (if you discount Rammstein’s second stage in the crowd, which I am) and I am a big fan of in the round stages. On the show, it was pretty damn ace. I can’t remember off the top of my head everything about it but the way the drones interacted with the stage was pretty special. In terms of songs played that night, they played all my favourites from the new album. Map Of The Problematique was a nice surprise as was Plug In Baby. Overall it was a great set list and a really good gig. Ginger Wildheart Band – Brooklyn Bowl, London – July - Would have been a strong contender for top 10, but I had to leave early to avoid a rail replacement bus. The last train back from London is long enough without a rail replacement bus being in the mix! Think this was Hey! Hello!’s first show with their new singer, which was cool. Ryan Hamilton’s band were a really good main support. The headline set by GWB was ace, and one which included songs I’ve not heard live before from the Silver Ginger 5 days, which was cool. It was really cool seeing Conny Bloom play with Ginger as well – something I hadn’t seen before. Also, I like the Brooklyn Bowl. 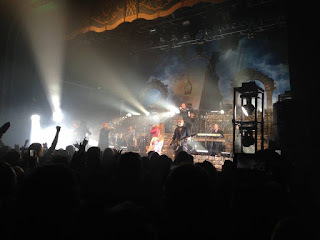 Amon Amarth – Roundhouse, London – November - Leaving this one out of my top 10 was a horrible decision. 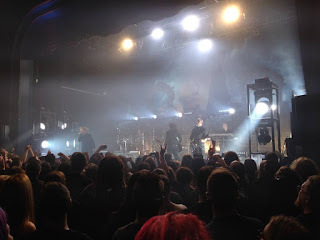 This gig ticked a number of boxes for me, including going to The Roundhouse in London for the first time (a venue I quite like now) as well as seeing Grand Magus live for the first time. They were really good. As were Testament, who were the main support. I saw them earlier in the year and whilst I enjoyed it, the sound mix that night was not their friend. Amon Amarth are an excellent live band – I’ve seen them deliver stunning sets in headline length slots at Wacken before. This was my second time seeing them at a headline show and this was just as good as the Wacken shows, if not better. Also, they had people with swords and shields battling on stage at different intervals which was pretty cool. Delain – Engine Rooms, Southampton – November - Similar story to the one above really. I left early to catch a direct train home as opposed to staying to the end and getting a service which involved a rail replacement bus. As much as I love the song We Are The Others, I don’t love it enough to have been on a stopping service replacement bus. The gig itself was excellent though. Delain showing off the best of their new album, Moonbathers, with some ace songs from their back catalogue mixed in. No “Sing To Me” though which was a shame. Alter Bridge – Genting Arena, Birmingham – November - I tend to not go to gigs just to see the support bands and leave before the headliner – but never have I been more tempted than I was at this gig. Alter Bridge are an excellent band, but they were the second best band when I last saw them in an arena (the best band that night were Black Stone Cherry). This gig had Gojira and Volbeat supporting – and they were third best. Gojira are a really good live band and the stuff from their new album sounds massive live. Having seen them live on a festival main stage, I knew they wouldn’t be swallowed by the stage – but they owned it. Volbeat…well what can I say? I’m massively in love with Volbeat and think it is criminal they aren’t headlining venues the size of the Genting Arena in the UK when they can headline stadiums and open air venues around mainland Europe! (More on that later). I enjoyed Alter Bridge a lot more than I thought I would, considering I’d just watched one of my favourite bands. They were very good. And so, onto the top 10. It was quite interesting when compiling the provisional list as I only had 9. The 10th spot was filled at the end of November. I went to three gigs in December which were all shouts for the top 10. Enough of the waffle though, the top 10 gigs I went to in 2016, starting with number 10. I’ve said this a few times, but I bloody love The Wildhearts. They are one of those bands that as soon as they announce a tour, I work out what dates I can attend, in the hope it is more than one. This London show was also the Birthday Bash as it fell on Ginger’s birthday which meant it had a bigger bill than the other shows on the tour. A bash usually is one long Ginger gig with loads of special guests. This one was multiple bands on the bill. Opening were Elvana, who I missed. Then it was The Main Grains, who I caught the second half of and thought were very good. Then it was The Dowling Poole who were good. Hey Hello were on after them, and they were superb. I liked what I heard from Jim Jones and The Righteous Mind but I disappeared after 3-4 songs to go for a smoke. Dirt Box Disco were the main support and they were excellent – they are just a lot of fun live. After they finished, I cursed the fact the Hey Hello tour earlier in the year was cancelled as they were due to be the main support – whilst Dirt Box are great in a bigger room, it would have been great to see them in a 150 cap venue. The Wildhearts came on and it was business as usual as far as a Wildhearts gig goes. The set list was a best of and it was outstanding. Unfortunately, Ginger was feeling unwell which became apparent during Nothing Ever Changes But The Shoes when he started throwing up on stage (didn’t miss a note of the song mind). I was expecting the gig to end there, but it didn’t. The crew came out and cleaned up the stage (so much respect for them) and Ginger and the band soldiered on throughout the rest of the set, including playing a song which I’d not heard live until this point – Stormy In The North, Karma In The South – which was ace. Danny McCormack joined them for the encore, which was cool to see. It probably should have been more special but Ginger feeling unwell was the main point of note here, and he started being sick again after Geordie in Wonderland which was a shame to see. Again, I anticipated the gig being ended but the final song, I Wanna Go Where The People Go, was played with special guest Frank Turner on vocals. The Wildhearts were just superb and this gig deserves its place on this top 10. It would without doubt been higher but I think after Ginger started throwing up, I expected the gig to end which took me out of the moment a little bit. If anything, Ginger and the rest of the band deserve the world of praise for finishing the gig – especially as well as they did. In another end of year post, I included my story about having seen Black Stone Cherry at the Wedgewood Rooms. That story was included in the entry for them playing Wembley Arena if memory serves. They played arenas earlier this year I believe and I decided to give that a miss as the London date was midweek. Then they announced this tour. This was a “an evening” with tour, with Black Stone Cherry playing an acoustic set, taking a short break and then playing a full band electric set. As it was taking place in my home town, it was a no-brainer. On a trivial note, when I saw them at the Pyramids in Portsmouth in 2009, they originally booked the Guildhall and it got downgraded. The acoustic set was brilliant, and they played Stay – which is one of my favourite Black Stone Cherry songs and one which hasn’t been played live in quite a long time (cheers Florida Georgia Line). A couple got engaged on stage during the acoustic set which was pretty cool. The full band set was ace – they played a few covers including Ace of Spades as a tribute to Lemmy. The set contained quite a few songs I’ve never seen them play live which is always good. It was great getting to see them play in Portsmouth again. I didn’t expect to see that happen after they started playing arenas. Black Stone Cherry are an excellent live band – and this gig proved that once again. I’ve wanted to see Billy Joel live for quite some time. When he came to the UK in 2013, I so wanted to go but I just didn’t have the money. Also, the London show was at Hammersmith, which was a shock – but it meant it sold out very quickly. He announced a show at Wembley Stadium for this year and I mentioned it to my brother, as I knew his wife wanted to see him live. He asked me if I could sort out the tickets for them, so it could be a birthday surprise for her – which I did. After I done that, and had the Ticketmaster order page staring back at me saying “Michael, you are going to see Billy Joel!” – I was slightly annoyed that I wasn’t. After a bit of deliberation, I decided to grab myself a ticket as well. As soon as I bought it, I had buyer’s remorse but that went away fairly quickly. Wembley Stadium all seated is a bit strange. I was in the upper tier, looking down on the pitch. Those poor bastards who sat down there got soaked during that gig as the weather was horrible. There wasn’t a support act for the gig which meant we would get about 2 and a half hours of Billy Joel which was pretty ace. The set was basically the perfect Billy Joel set list for me – with the added bonus of an AC/DC cover thrown in for good measure. Joel and his band were on top form all evening. I had read some reviews of his European tour which were all full of praise – so I went in with high hopes and I was not let down. This was a great gig. Going to this gig ticked a box for me, in that I’d wanted to see Springsteen live for quite a while but never got round to doing so. I have spoken to a number of people about his live shows and every review was glowing. My parents, who had seen him once before this gig, said they didn’t know exactly what was going on (he played Darkness on the Edge of Town in full), but they could tell it was something special. 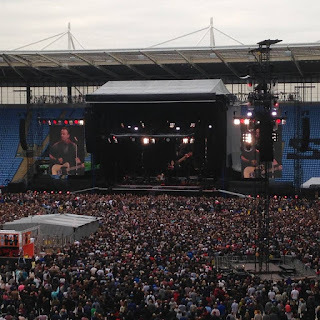 This gig just happened to fall on my Mum’s birthday, so I went to visit them and we all went to see Springsteen together. In the US, he had been touring the album The River. I was a bit disappointed when that didn’t happen in Europe but not so disappointed that it took anything away from the gig. No support band for this one, but one wasn’t needed. 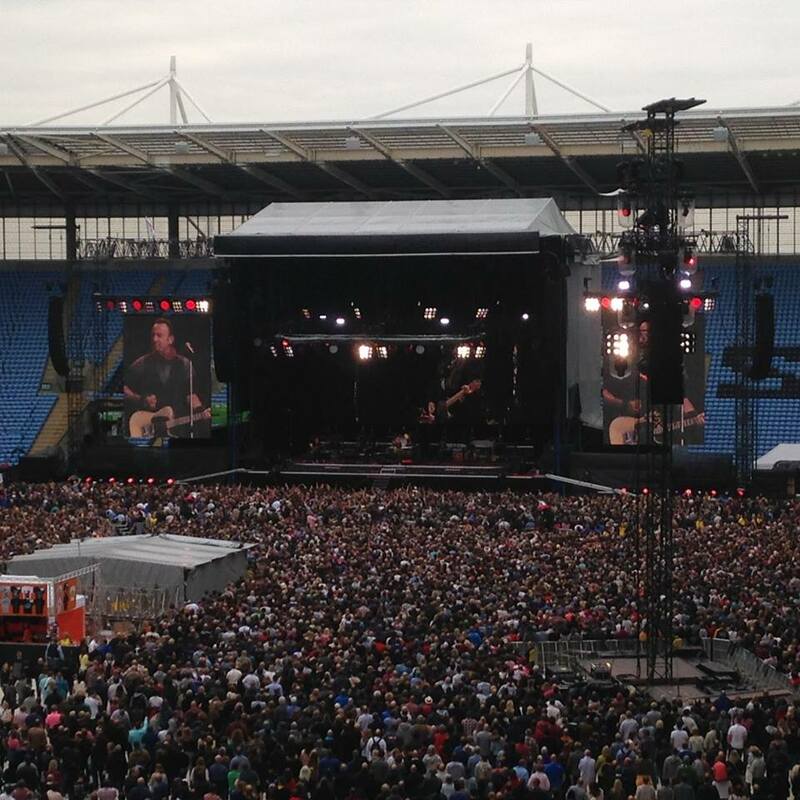 Springsteen and his band played for about 3 hours I think, maybe slightly longer. All of the reports I had heard set my bar pretty high for this gig – that bar was surpassed and then some. The whole gig from start to finish was just great – even when songs were being played that I didn’t know, I didn’t feel bored, waiting for one I wanted to see/knew. One thing which impressed me is just how well prepared the band were for the fan requests. They played three fan requests – and one of them was a song rarely played live. Now, they might have ballsed it up for all I know about the song in question – but based on the crowd reaction to it, it didn’t seem that way. They played a few cover songs throughout the course of the evening, the highlight being Because The Night, a Patti Smith song. The overall gig highlight for me was when they played several in quick succession that I loved – Born In The USA, Born To Run and Dancing In The Dark – outstanding stuff. I went to this gig, as said above, to tick a box but I would 100% go and see them again. Funny that this gig is here given the first time I saw them live, I dismissed them. I have come to the conclusion that they had a bad sound set up the first time I saw them. It wasn’t great. I saw them again at the Wedgewood Rooms which was noticeably better but I had to leave early to catch a train home. I didn’t give them much thought until I saw them at Download 2011 and they blew me away with how good they were. I wanted to go a headline show to see them again but I couldn’t make any of the London shows that cropped up between this set and their set at Download 2015 – which was even better than the 2011 one. I fully intended to see them on their headline tour in 2015, but I waited too long to get tickets and they sold out. I made plans for that day and then the gig got moved to a bigger venue as the Shepherds Bush Empire needed emergency work doing to its roof (after The Wildhearts blew it off in September – maybe). So there were now tickets available, but I had alternative plans. This tour came around and I again held off buying a ticket but got one in the upper standing area, which actually I quite like. Lionize were playing as I walked in, who I thought were quite good. I also liked the main support – Valient Thorr – but not as much as Lionize. Clutch came on, opened with The Mob Goes Wild and from that point, this gig was just outstanding. There was not a single “piss break” moment during this gig. The set was almost perfect for me but no Earth Rocker was a bit of a disappointment. That is the only negative I have to say really. This gig made me go back and listen to the latest album again (which I already liked) and discover just how damn good the song Firebirds is. There was a pretty long pause before the encore of Electric Worry and X-Ray Visions – which was a superb encore. Of all the times I’ve seen Clutch live, this is definitely the best. For most of these entries, I’ve written a bit of context to go along with discussion about the gig. That is a straightforward task for this one – In 2014, the Frank Turner & The Sleeping Souls gig at the Guildhall was my gig of the year. In 2015, it was my second favourite gig of the year. It seems strange putting it in 5th this time around as it was outstanding. It has been a tough year for establishing an order. I missed the support acts because I was in a pub across the road (I know; I am an awful person). I don’t tire of seeing Frank Turner live. Much like The Wildhearts, when Frank Turner announces live dates in the UK, I try to work out if I can make any. This set list was a bit different to the tour from last year but was still pretty great. Also, getting to hear him play Love, Ire and Song was just great (played it in 2014 and I have no memory of it taking place – despite not being overly drunk for that gig). I don’t know if there is anything else to add really – another year, another excellent Frank Turner show seen. I wrote a full review of the gig here, so I won’t tread over too much old ground again. What I will say though is that when I was heading to this gig, I had hoped it would be in my top 10. I had no idea it would be so good that it was a genuine contender for gig of the year at one point. It has changed place on this list a number of times, ending up in 4th. It was a headline show I had been waiting to see for nearly 10 years and it was much better than I ever thought it would be. I wrote a full review of the gig here, so I won’t go as in depth with this one. The review of this gig was the most recent post to this page before this one and just re-reading it, it reminded me just how special it was. I don’t think I need to add much more than that really. I missed Weezer at Sonisphere 2011. I had a headache kick me in the...well head I guess, during Sum 41 and I left the arena to take a break to shake my headache off. I came back in to watch Ginger, who played a great set. However, I left the tent and my headache was back and worse. So I left the arena again and didn’t come back. This meant missing Weezer – but I remember being alright with this because I was convinced they would come back. And then they didn’t. As the years rolled on, no UK show happened. They released an album in 2014 which was pretty decent but still no UK show happened. Then The White Album was announced to come out for earlier this year, alongside a couple of UK dates – Manchester and London. It was midweek which was a pain for those who don’t live in London – but I had to go. The support band were Dinosaur Jr, who were really good. I’d seen them once before at Camden Rocks festival which was also good. However, having a good support that night was little more than a bonus. 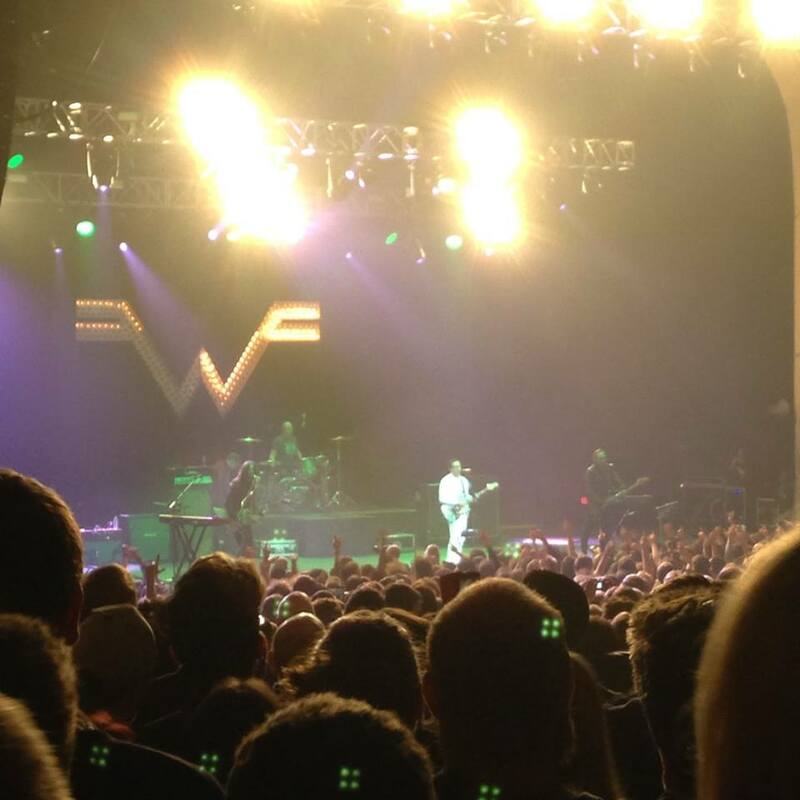 I was there to see Weezer and they did not disappoint. I had managed to listen to The White Album twice before going to the gig (it is great by the way) so I was somewhat familiar with them. It seemed I was in the minority though as the crowd didn’t really singalong when the 5 songs from the new album were played (it was a bit louder for the stuff from Everything Will Be Alright In The End). However, when they played one of their better known songs, the singalongs were something else. In the first half of their set, from their back catalogue, they played My Name Is Jonas, Hash Pipe, Back To The Shack, El Scorcho, Pork and Beans and (If You’re Wondering If I Want You To) I Want You To – the singalongs were loud. 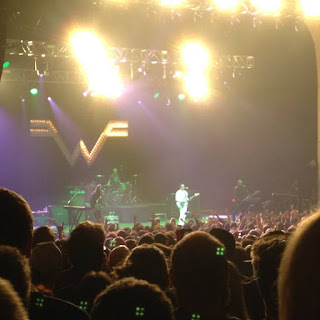 This to me was almost the perfect Weezer gig (and had they played Dope Nose, it would have been). I’d seen Avantasia twice before this night, both times headlining Wacken festivals and both times they were my band of the festival. I did not anticipate they would play a UK headline show and this view was reinforced when Team Rock Radio were plugging Bloodstock Open Air in 2013 and mentioned just about every band playing apart from Avantasia – who were sub-headlining the Saturday night. One of the publications that fall under the banner of Team Rock, Metal Hammer, when reviewing the festival wrote something like apart from the 500 diehards there, no-one could care less – can’t imagine why that could be. Anyway, fan boy annoyance aside (not least as I couldn’t make that show), when a headline show was announced, I snapped up a ticket immediately. It was “an evening with” set up in that there was no support band. Doors opened at 7, Avantasia came on at 8. 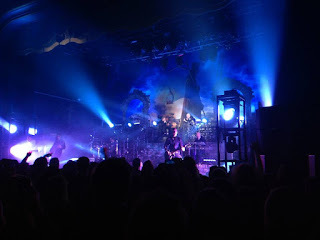 The new material from Ghostlights worked so well live as did all my old favourites that I had seen previously at Wacken. Tobias Sammet was only not on stage for 3 of the 24 songs of the night (sadly, two of them are my favourites but no matter) which is pretty damn impressive. It was everything I hoped it would be and then some. Looking back at the set list from that night now, I’m really struggling to not say “all of it!” were I to be asked about the highlight – and that to me is the sign of a great gig. I’ve spoken about this gig without once giving mention to Michael Kiske. My favourite Avantasia songs that have more than one singer usually feature him, and he was so good during this gig. That isn’t to say the other singers and musicians weren’t great, because they all were. I think the thing which made it gig of the year for me was seeing this music that I absolutely love in such an intimate setting, given the context of the previous times I had seen them. They were always great at Wacken, but this was just something else. I remember watching their first live DVD, and there was a clip of them playing a venue in Argentina the size of The Forum. I remember wishing they would do something similar in London, and speculating just how incredible it would be (and then being annoyed because it would never happen). It did, and it was (and then some). And that, for 2016, is that. It has been a good year for gig going and I’ve been to some great gigs. I suspect I will do this again next year and I can already see some potential gig of the year candidates in my calendar. At this stage, it is hard to look past Guns N’ Roses at Olympic Stadium – but we shall see. Had you asked me this time last year what my gig of 2016 would be, I would probably have said David Gilmour.